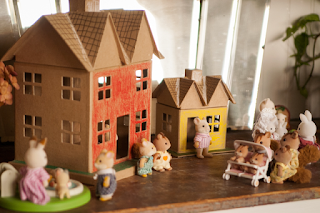 When I visited my mother yesterday she wanted to stop in at Hobby Lobby, and we spotted these adorable plain brown houses just right for Daisy and her Little Animals. They are sturdier than cardboard (they're labelled paper mache), and the roofs come off like lids, and you can color them. Yes! 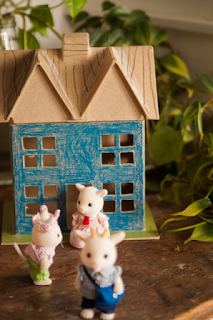 My girls have been asking for a Calico Critter house but we've just invested in the animals and furniture because the houses seem too expensive for what you get. These will be perfect for Christmas! I would definitely move to a village that sweet and charming. kittens in the stroller! I think I may want to play, too. 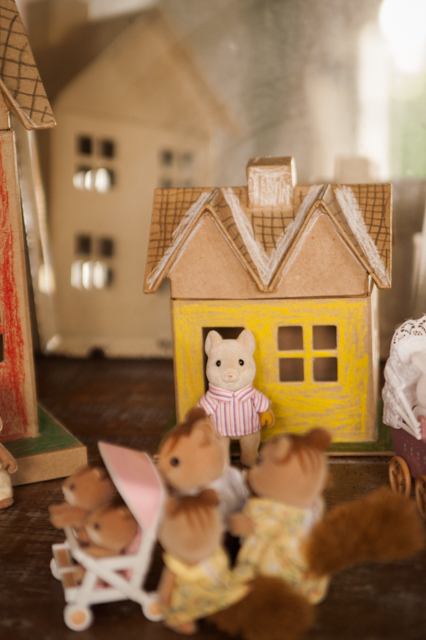 Sweetest village ever! Love this! Can we all live in Daisy's world? Such a cute village.. I know Daisy is having so much fun playing with this village. Where oh where do you get the sweet little animal figures? First time I have commented, but a long time reader. Julie, these are called Calico Critters or Sylvanian Animals and we order them from Amazon. Larger cities may have them in toy stores--or you could always go to Germany, where you can find whole window displays full of them . . . .Daisy's dream career is to work in *that* shop. Is there a donkey family? They could be delivery men.